Update: 12:43 PM - I have removed reference to an earlier design proposal for the site after learning it is not affiliated with the current design study now underway. I apologize for any confusion. 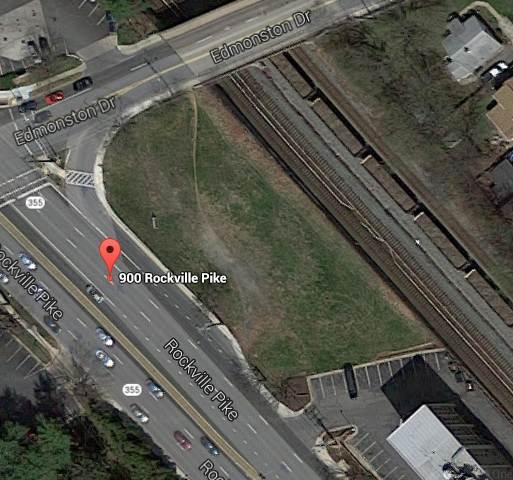 A new developer, J. Danshes, LLC, is exploring the potential of developing one of the few greenfield properties along MD 355, 900 Rockville Pike. The 25,863 SF plot is also one of the most challenging to utilize. Just a few years ago, the latest applicant was unable to obtain approval from the Rockville Planning Commission for a billiards business there. The primary issue has been the "landlocked" nature of the site. Hemmed in by the Pike, Edmonston Drive, the CSX/WMATA tracks, and a commercial development directly south of the property line, previous applicants have been unable to get satisfactory ingress and egress curb cuts for the site. First the Maryland State Highway Administration rejected the idea of an additional curb cut access from the Pike, and curb cuts on the Edmonston side were deemed unsafe. Then the property owner next door, understandably, objected to patrons of 900 using that property's curb cuts to gain access to the Pike. This new potential applicant has hired the local architecture firm of Steven J. Karr, AIA, Inc. to come up with a plan for the (currently unknown) use it is considering there. Karr's firm designed the first retail building you encounter when entering the City of Rockville from the south, the successful Rollins Center on The Pike, at the southwest corner of the Pike and Rollins Avenue. That building was fully-leased when it was delivered a few years ago. Perhaps an agreement has been reached with the property owner to the south, such as compensation, that makes it a win-win for both parties. We'll likely find out when the plans are eventually submitted to the City for review. The Karr design study is expected to be complete by June. Another Karr disaster. No imagination to the architectural style what-soever. 10:49: He hasn't even shown a design yet! How can you criticize it at this point? Past performance is the benchmark.